Does your home’s paint need a refresher? 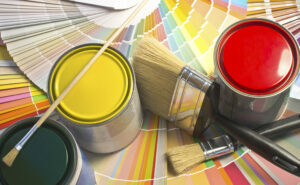 Is the paint in your home looking worn and need to be refreshed? Do you think the outside of your home needs to be spruced up? Undertaking a painting project yourself can be a huge task, with days of picking the color you want, moving furniture, covering things up, and laying tape around, just to find yourself painting again to cover up drips or cleaning up remnant paint on baseboards where the tape didn’t adhere perfectly, or worst-case-scenario, you finish your project and hate how it looks. Hiring a professional painting service can give you an advantage when choosing colors, and you won’t have to worry about a mess in your home, a sub-par job, or the project taking much longer than you anticipated–they’ll take care of all of that for you. We’ve all been there; you love that trendy color in the store, you get home and put it up on the walls and surprise! It makes your small space look drab, dark, and tinier. A professional painter will be able to work with your palette choices, but also give you real advice on what is going to look good in your home. If you love a statement color, they can suggest how to incorporate it into your color scheme to make your home look trendy, but livable as well. There’s nothing more frustrating than moving your drop cloth every time you move your ladder just to find paint drops on your carpet or drips on your baseboards. A professional painter has the best equipment and will know just what to do and how to protect the details of your home, so your carpets will remain pristine and your baseboards unscathed. Preparing your walls for painting can be a time-consuming process, from sanding to spackling and primer coats and when all is said and done, you may miss spots or a spot on your wall is uneven, etc. A professional painting company will do all of the wall prepping so the color lays evenly and the lines are neat and clean. A painting project on your own can take weeks or months depending on how busy your schedule is and how much time you can dedicate to painting. A painting professional will be in and out, working as quickly and efficiently as possible to get your home back to normal and your room looking like new! This entry was posted on Friday, January 12th, 2018	at 2:47 am	and is filed under Painter	. You can follow any responses to this entry through the RSS 2.0	feed. Both comments and pings are currently closed.